While most followers of American politics in Ireland are currently watching with some bewilderment the topsy-turvy contest to become the Republican presidential nominee and assessing Barack Obama’s re-election prospects, there is a United States Senate campaign that is also likely to start to attract some attention on this side of the Atlantic in the coming weeks and months. That is the race in Massachusetts between incumbent Republican Senator Scott Brown and the all but certain Democratic nominee, Elizabeth Warren, a Harvard Law School professor. Scott Brown pulled off one of the greatest upsets in Massachusetts political history when he defeated the Democratic nominee, Attorney General Martha Coakley, in a special election held in January 2010 to fill the seat of the late Edward Kennedy. Aer Lingus offers special discounted fare for Irish Central readers! Brown, a lawyer and then state senator married to a glamorous former television news reporter with two beautiful daughters, ran an outstanding campaign. He scored points with broad swathes of the Massachusetts electorate, most notably among women voters, by constantly touting a “regular guy” image, subtly amplifying his good looks and rather credibly claiming “outsider” status. Conversely, Coakley’s effort was dismal and listless. She appeared aloof, bought into the prevailing wisdom that victory was inevitable and, famously, expressed an unwillingness to shake hands with fans of the New England Patriots outside Gillette Stadium. This perfect storm facilitated the unthinkable: a Republican took the seat that Senator Kennedy held for nearly half a century. Elizabeth Warren is out to prove that she’s no Martha Coakley. To that end, candidate Warren and her political advisers are basing their appeal to Massachusetts voters around an inspiring life story and a robust track record of achievement as an academic and consumer advocate. The product of a working class upbringing in Oklahoma, Warren married while an undergraduate and later finished law school while pregnant with her second child. Early in her law teaching career, she began to champion the cause of consumers and to dispel the negative connotations around declarations of personal bankruptcy. Widely recognized as a leading expert in her field, Warren ultimately served the Obama administration in a number of advisory capacities. She relocated to Massachusetts after she took up a post at Harvard Law School in the early 1990s. Since announcing her long anticipated candidacy, Warren has raised a tremendous amount of money, won over many who were initially skeptical about the appeal of a Harvard academic and outsider to the broader electorate in Massachusetts and just about cleared the field of Democratic primary opponents. 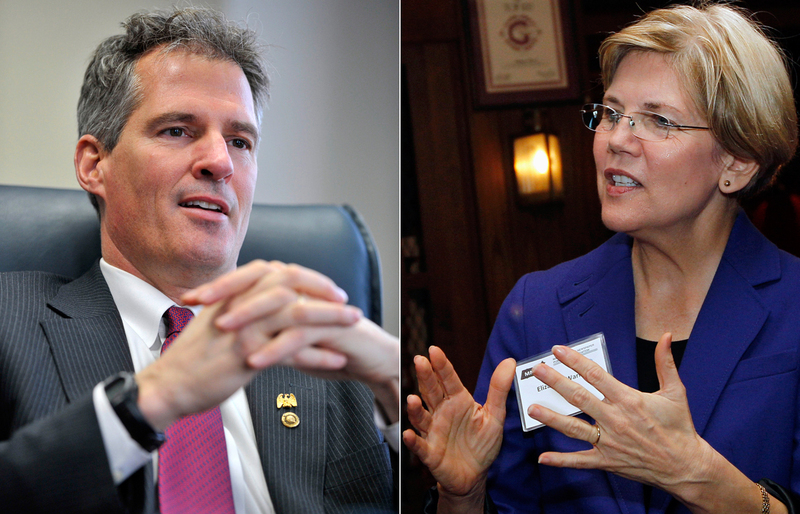 Early polls show a very tight match-up between Brown and Warren. At least one major poll gives her a three point edge. While Warren has gotten off to an impressive start, she still has a way to go. It is this at times inescapable professorial demeanor that Scott Brown will be eager to contrast with his rugged, “everyman” persona. Against Martha Coakley, Scott Brown found a somewhat unexpected groundswell of support in working-class, traditionally Democratic strongholds like Dorchester and South Boston and in similar neighborhoods in smaller cities around Massachusetts. Clearly, he will be aiming for a repeat performance. At the same time, Warren’s advisers will remind their candidate at every opportunity that she is trying to persuade Massachusetts voters, not the Harvard Law School faculty, of the merits of the case she is making. Moreover, Scott Brown fared very well with the large constituency of Irish-Americans in Massachusetts in 2010. In addition to polling strongly in urban neighborhoods with high concentrations of voters of Irish ancestry, Brown won heavily Irish-American towns south of Boston, such as Braintree, Hanover, Hingham, Marshfield, Norwell, Pembroke and Scituate. Brown knows that a healthy majority of Irish-American voters in Massachusetts, many of whom are old-fashioned, Catholic Democrats disillusioned by their party’s leftward lurch on social issues, would nonetheless have still regularly supported Senator Kennedy. The prevailing wisdom was that these Irish-American Democrats would stay loyal to their roots and vote for Coakley under the circumstances. Brown’s victory defied the prevailing wisdom. Senator Scott Brown was motivated to file this bill for the very same reasons that Congressmen Brian Donnelly and Bruce Morrison filed their now legendary visa bills. It is both the substantively correct and politically advantageous thing to do. That hasn’t stopped at least one commentator, Dinkar Jain of the Huffington Post, from criticizing Brown for engaging in “blatant vote-bank focused identity politics” when he filed the visa bill to benefit the Irish. There’s always one, unfortunately. As a Democrat, I think Elizabeth Warren should formally declare her support for the bill immediately – as well as signalling a willingness to fight for the undocumented Irish – and I am sure that she will aggressively court Irish-American voters in Massachusetts. As an Irish-American, I find Brown’s support for this visa bill to be immensely gratifying proof that ours is still an important constituency in 2012. It’s a real rebuke to the naysayers who deny the political vitality of Irish America. The likes of Trina Vargo of the US-Ireland Alliance and journalist Niall Stanage are wrong when they argue that there is no Irish vote and that there are no Irish issues that matter in the United States. To see that the opposite is true, they need only look to what is liable to become the most interesting and hardest fought United States Senate election this year. Irish-American swing voters in urban neighborhoods and in towns south of Boston could very well decide the outcome. It should be fascinating.